Dukkah, an Egyptian condiment with a distinctly nutty taste, is definitely not a typical spice blend but, rather, a fragrant combination of roasted nuts and seeds. It can be found in most ethnic markets but it's easy to make at home and there are lots of possible variations so you can experiment and find your perfect custom blend. Typical dukkah contains some common ingredients such as nuts (usually hazelnuts but other nuts can be used), sesame seeds, coriander and cumin along with salt and pepper. From there, you can add your own spin with things like mint, dried thyme or peppers for heat. You can use dukkah as a crust for meat, chicken or fish, as a dip for pita bread and olive oil or as a seasoning for vegetables. 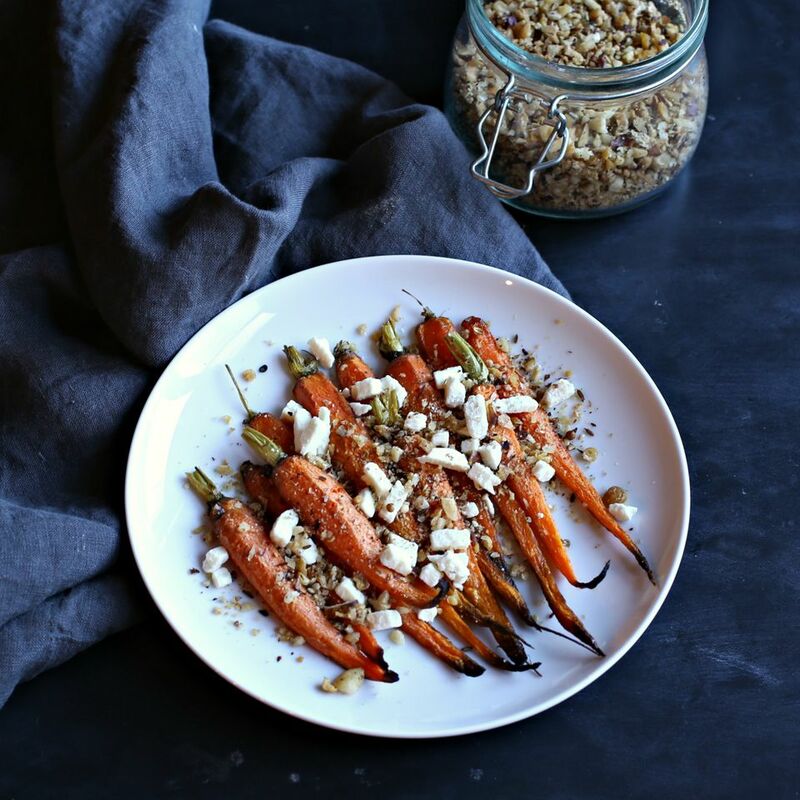 I love roasting carrots (buy the ones with the green tops still on because they're fresher and sweeter) with olive oil and then topping them with the dukkah and a bit of tangy cheese. It makes an ordinary vegetable side dish something extra special. To make the dukkah, add the hazelnuts to a dry skillet or cast iron and toast for 1 to 2 minutes, stirring often. Move the hazelnuts to a dish and add the sesame seeds, coriander seeds and cumin seeds to the pan. Toast for another 1 to 2 minutes and remove from the pan. Add the toasted hazelnuts, sesame seeds, coriander seeds and cumin seeds to a food processor and pulse for 2 to 4 minutes. You want the ingredients to break down into very small pieces but not to turn into a paste. You can also do this by hand in a mortar and pestle. When ready to make the dish, pre-heat the oven to 400 F.
Peel the carrots and slice in half lengthwise. Toss in the olive oil and place on a baking sheet lined with parchment paper. Roast for approximately 20 minutes or until the carrots are just fork tender. Place on a serving dish and top with the crumbled feta and the dukka. Serve warm. In case you want to make the dukkah in the oven, pre-heat your oven to 350 F and spread the nuts and seeds out on a baking sheet lined with parchment paper and roasting for about 2 minutes.